The snow has melted. Colour has replaced the monochrome scene. These are the Hellebores that have survived the weather in my garden. Hellebore hybrid from Barnhaven Primroses classified as ‘open pollinated’ Hellebores. 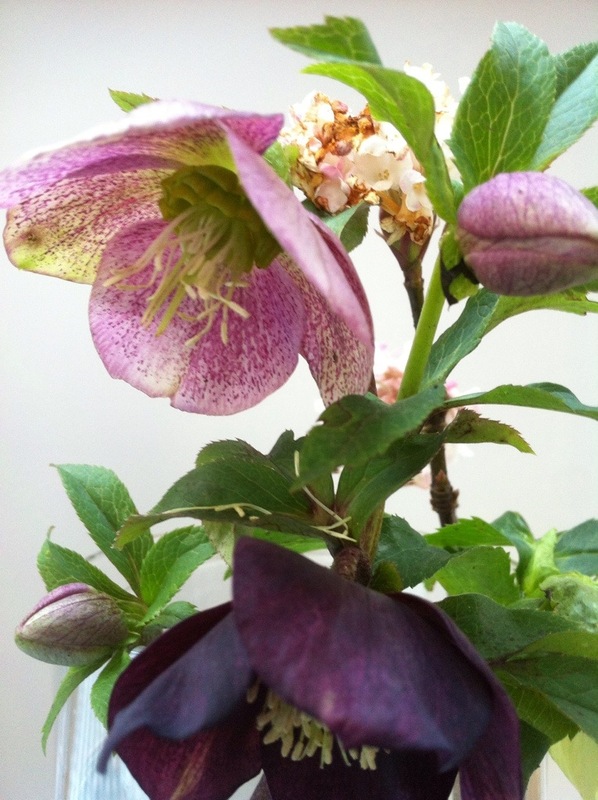 It is rather a pot luck way to purchase Hellebores but this one is a new favourite. I especially like the colour. Finally this newly transferred, highly freckled one is from Gwladys Tonge’s garden, identity unknown but forever called Gwladys in my garden. 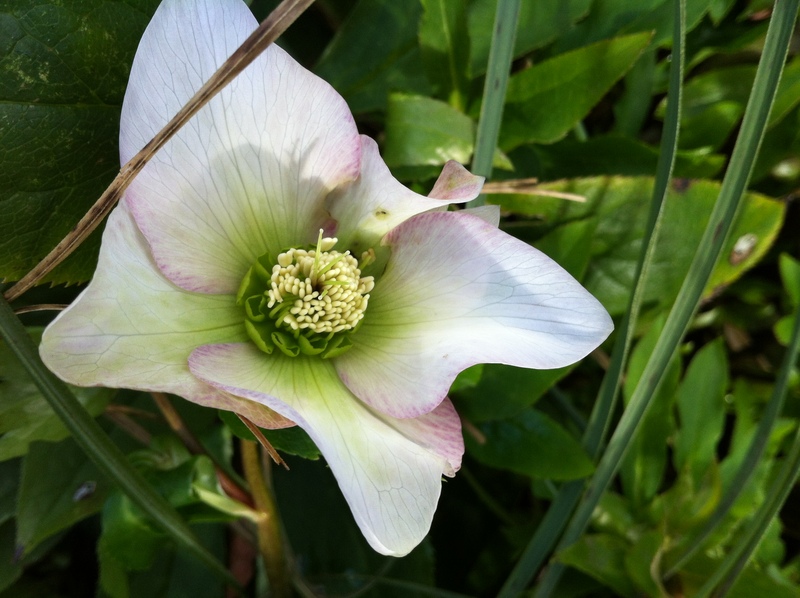 This is Hellebore season and social media is full of yummy pictures of them. If you need another fix take at look Cathy on her March post as she has joined Chloris with her monthly post to review what is looking good in the month. So many lovely plants. This morning is of course Monday, that much you know and it is bitterly cold again which you may not know if you are elsewhere in the world ( hello Brother Dorris) but it is thankfully bright. 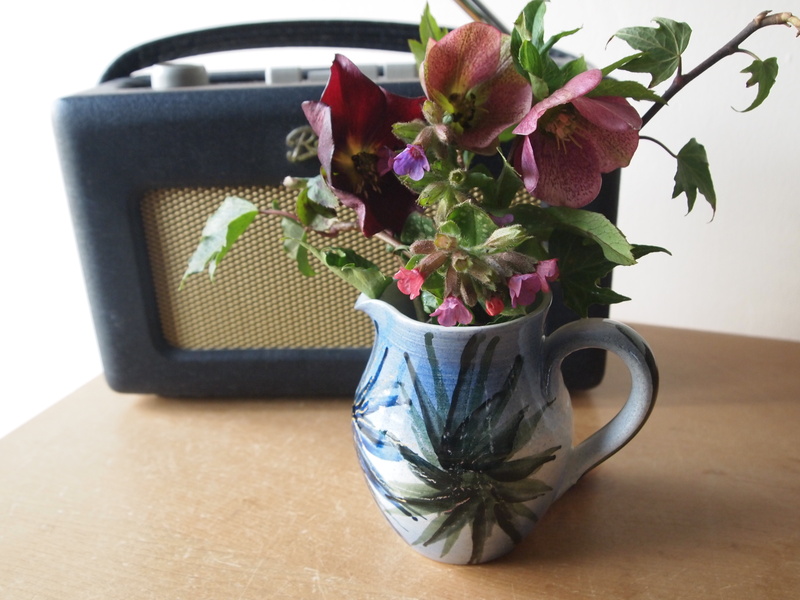 As it is Monday I am going to join Cathy with a bowl rather than a vase full of hellebores. Hellebores never last very long if cut and brought into the house, yet floating the heads on shallow water seems to suit them better. Certainly we can observe the beauty of each flower much more easily like this rather than having to tip their shy heads towards us. I should love to be able to tell you which varieties are here but they are not mine. Hold up, not mine ? 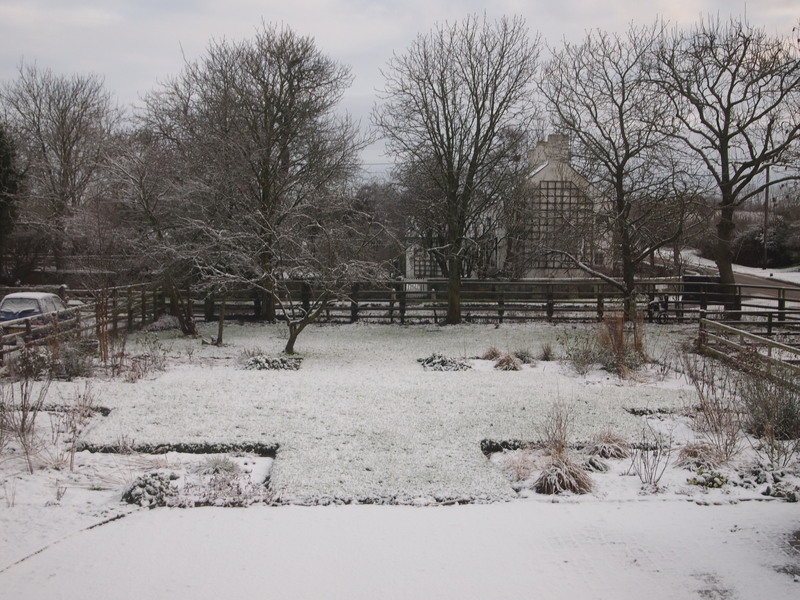 You see I visited a delightful garden on Saturday, open for the National Garden Scheme. NGS. Old Church Cottage is in a very pretty and historic spot, brimming with snowdrops and crocus, cyclamen and hellebores. More about that another time. On the table, welcoming visitors, was this bowl of blooms. Can I pinch that? Well I just did. Have a great day and stay warm. D.
This Monday stage two of my boundary fencing starts. ‘Drew was expected to arrive from Norfolk late morning, it is quite a drive after all. It suddenly occured to me that some of the daffodils just emerging under the trees would in all likelihood be trampled. Quick as a flash, well sort of, before he could begin to unload his van of tools and materials, I nipped out to pick a few vulnerable flowers. Daffodils and Hellebore. I prefer to see daffodils in the garden rather than cut for a vase but these few needed saving. I hope that you have had a good Monday. More about the boundary willow weaving to follow. 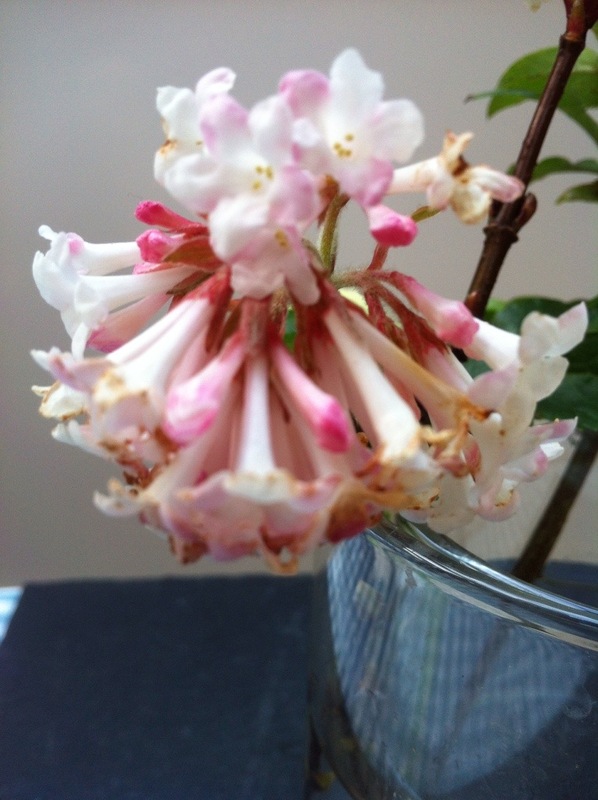 to read what she and other bloggers have put in their vases this Monday. These were saved from busy feet. 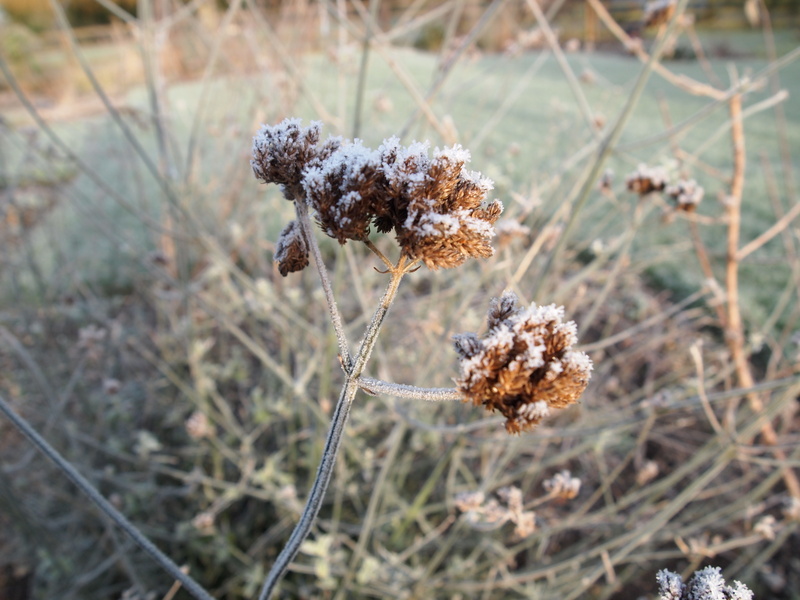 January has thrown all weathers at us: minus 5 degrees last week and 12.5 degrees today. There has been wind, rain, snow and ice and now we seem to be about to get another round of rainy weather. Exhausting. What’s a girl to wear? I find myself tuning in to the weather forecast each and every day. The poor plants are as baffled as we are. Snowdrops and daffodils are in flower. 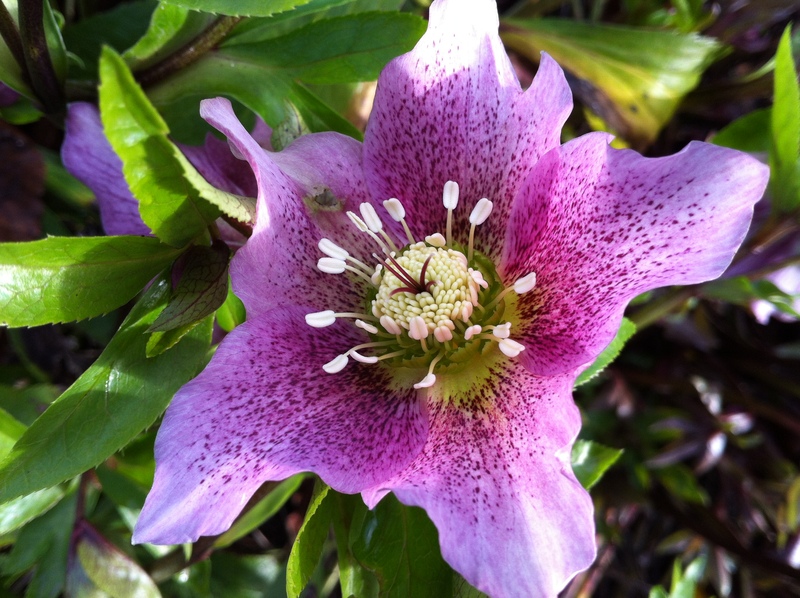 Hellebores are blooming, roses are beginning to shoot. In London yesterday I noticed Magnolias in flower. Yet what to choose for Cathy’s In a vase on Monday? 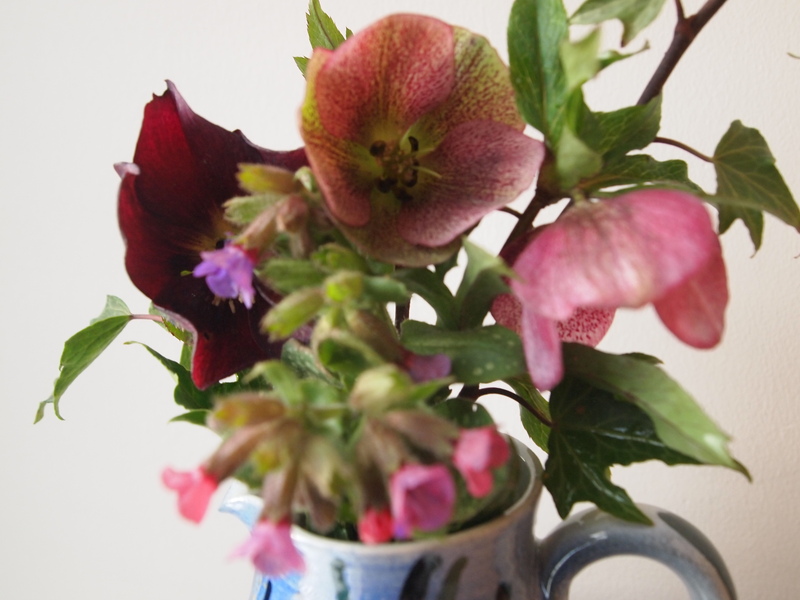 Well I have decided to make the most of the Hellebores, mixing two small blooms with the tiny pink Pulmonaria. I have wound a long strand of Ivy to hold the stems together and to enjoy the scale of the ivy leaves with the flowers. 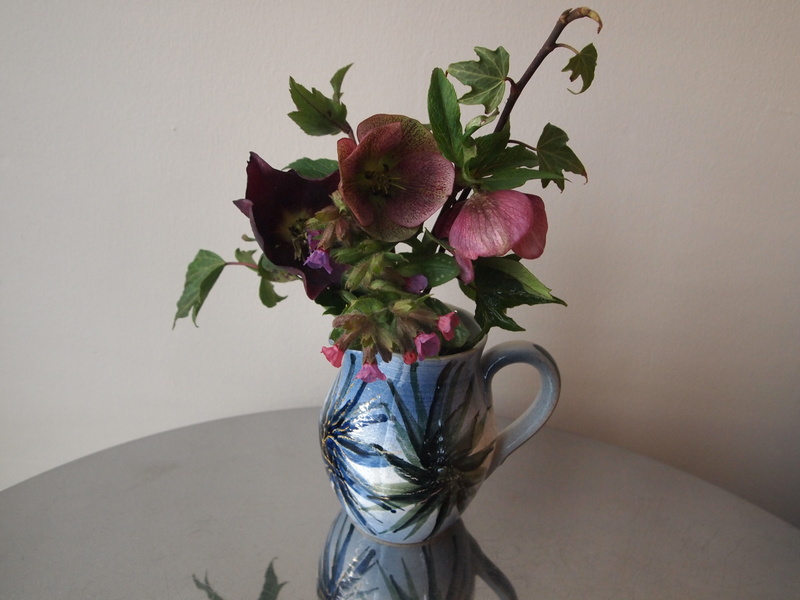 Placed in the small blue jug from the Isle of White, an engagement gift many years ago, the blue jug seems to hint at the blue tones in the Hellebores. Positioned next to the radio, the flowers are ready perhaps to hear the all important forecast. Shots of the garden taken this month. Whether the weather be fine, whether the weather be not, enjoy your week. Welcome to January 2016. I am joining Cathy at https://ramblinginthegarden.wordpress.com with her weekly meme. The in a vase on Monday is a great start to the week and I encourage all of you to take a look at some of the other vases submitted. If you are inspired to take part, remember to add a link back to her site. I admit this Monday my offering is hardly an arrangement, barely a vase full. Three Hellebores and a snip of Viburnum bodnantense New Dawn. Really it is more like a pot of samples, a selection for identification. Nothing artistic. Yet they are beautiful. Shy faced Hellebore, exposing their faces early this year due to El Nino. Trumpets of show-stopping scent from New Dawn. Back to school and work, 2016 is a go-go. 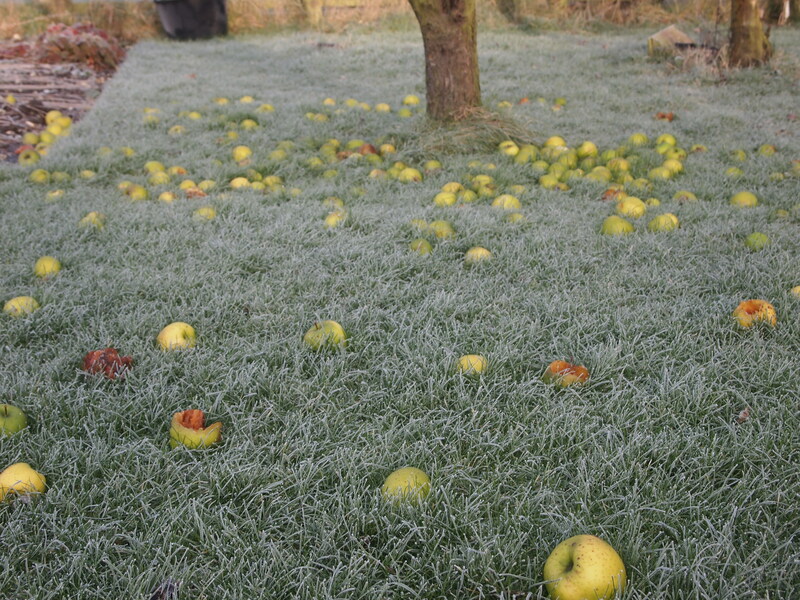 Judging by the early starts out in the garden, it may be interesting. Have a great week and let us all hope the rain stops soon. Enough already. 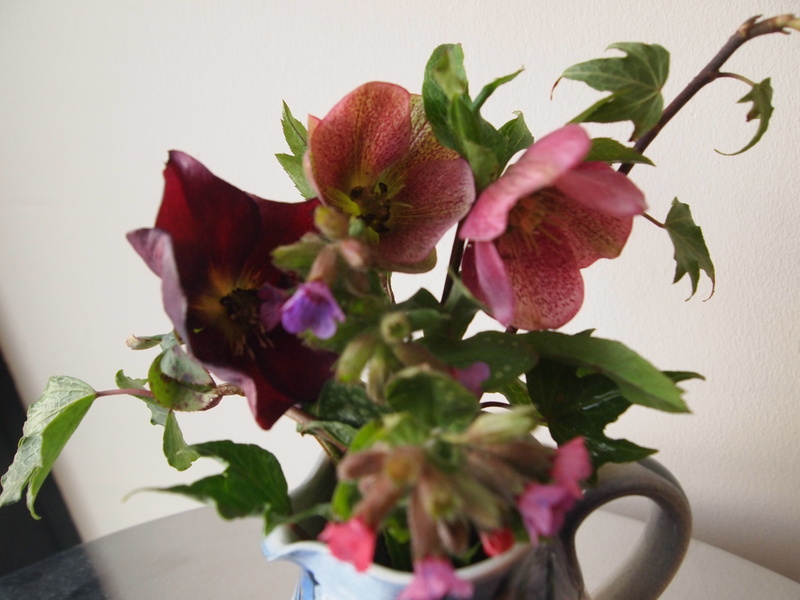 Happiness is ……………….a Hellebore or two. 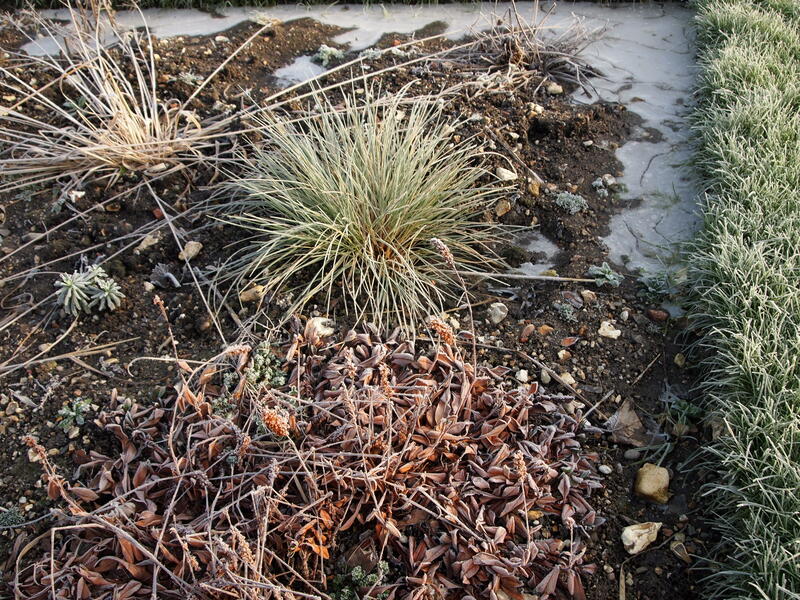 These were taken on 28 January in a rare moment of sunshine. Today it is raining, again, and somehow they look even more delightful and cheery, so I thought I should share them. I hope you like them.